Once again you are all cordially invited to our Spring Meeting on Sunday April 1 2012, from 10 am in the Conservatory of the Botanical Gardens, Harvardlaan 10 in Utrecht. Until about 11 am there will as usual be an opportunity to drink tea or coffee, chat to each other, exchange or buy plants and to consult the literature displayed on the reading table. 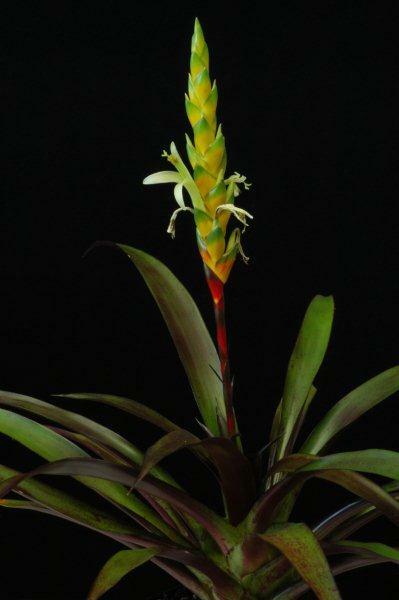 This year there will also be several volumes of both the Journal of the Bromeliad Society International and of the German Bromeliad Society's Die Bromelie. Fig.1. 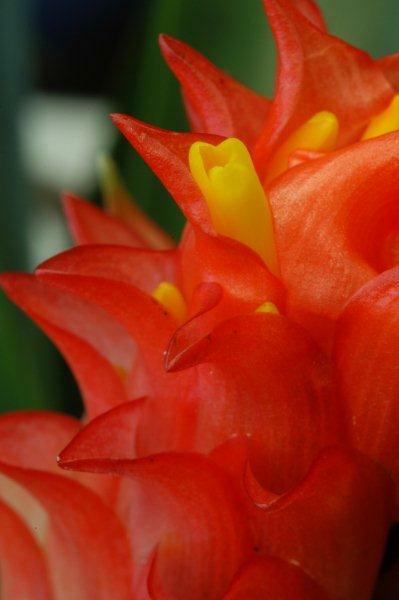 Guzmania osyana (fusispica sensu hort. ), photos by Eric Gouda, click on the photos to enlarge. We are happy that Jeroen van der Steen will be coming. In the afternoon he will take us on his journey “Criss-cross through South America”. We are equally pleased that our fellow hobbyist and bromeliad grower Bert Westerman from Uelsen will be present. 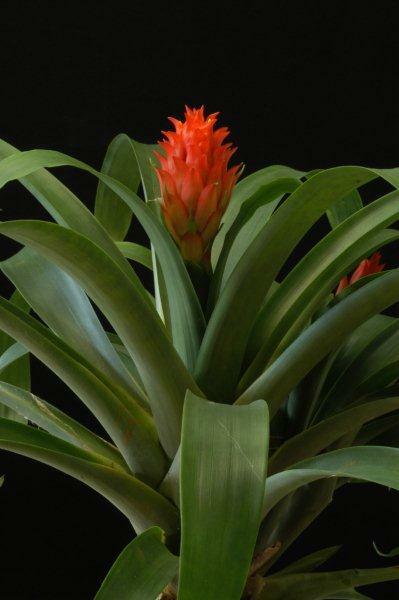 He will be bringing us plants, including unusual bromeliad species, for the plant auction we are organising this time. There will be a raffle too, for plants brought by members. Spring is coming and many a hobbyist will find that repotting and thinning out their plants will provide plenty of excess cuttings and (mother)plants. So please bring them along for the raffle table. Fig.2. 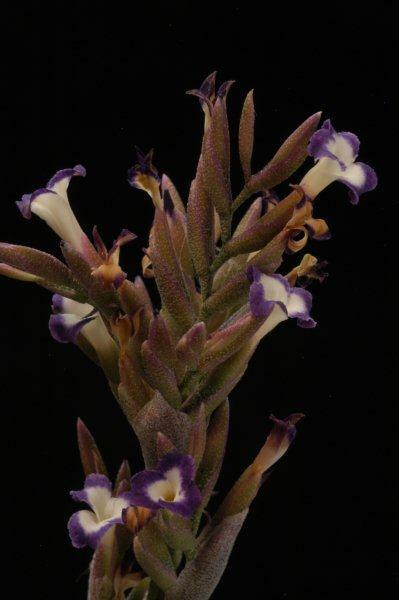 Tillandsia purpurea (not easy to get it to flower), photos by Eric Gouda, click on the photos to enlarge. 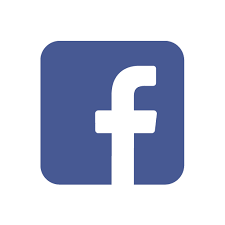 At 11 am there will be a short house-keeping meeting which will begin with announcements and any items received followed by the minutes of the last Autumn Meeting (Newsletter 58) and by the Treasurer's announcements. Further points to be discussed will be firstly, that in January we received a discussion paper from Nico Bouthoorn about the creation of a BCG Forum. To save time we refer to his email of January 7 2012 which is on our discussion list together with the associated reactions of several members. The Board suggests that a decision on the subject should be taken together with the contact group's members. The next point will be the BCG's Day Out in 2012. After our visits in past years to the Hortus Botanicus (Botanical Garden) in Leiden, to Tillandsien Holm (Germany), Westermann Bromelien (Germany), Nationale Plantentuin Meise (the National Botanical Garden at Meise in Belgium) and the Orchideeënhoeve in Luttelgeest, a plan is now maturing for a visit to the Botanical Garden of the University of Ghent in Belgium. Mrs Chantal Dugardin, the hortulana there, has proved willing to show us round the collection greenhouses that are normally closed to the public (200 square meters of Bromeliads, orchids and succulents). Walking round these, as well as the other, publicly accessible, conservatories and the gardens, will take about four hours. A visit in early September is advised as Ghent, as a university city, will be overrun by several thousand students after that. This would seriously complicate any plan to end the trip by enjoying a bite together in the city centre! While previous excursions were on Saturdays, Ghent would have to be on a weekday! The members present will be queried about their interest in this excursion and about a suitable date for it. If there is sufficient interest, and allowing for any further wishes people may have, the plan can then be further worked out. You can anyhow start by looking up the "Ghent Botanical Garden" on internet, along with the historic city of Ghent itself. We will close the meeting by considering any other business. Fig.3. Neoregelia smithii, photos by Eric Gouda, click on the photos to enlarge. After the house-keeping meeting, there will be a plant discussion. Don't be embarrassed to bring some so-called problem plants along with the lovely flowering ones. We will all be there to study and to learn from each other. After that we shall move on to the previously mentioned raffle and to the auction of the plants we have bought from Bromelien Westermann. Lunch will be organised as usual by the Gouda family and, as said earlier, after the lunch break Jeroen will take us on a journey "Criss-cross through South America". We hope you will all find your way to Utrecht again and that it will once more prove to be a very enjoyable Bromelia day. Until then! 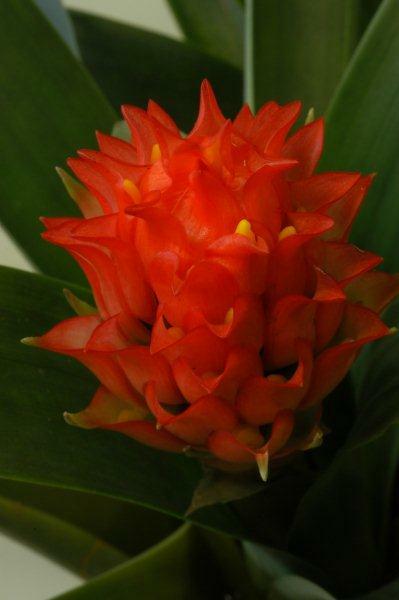 Plants grown as Guzmania fusispica and present in many collections (Botanical Gardens) must, sadly, have their names changed to G. osyana (fig.1). This thus results in G. recurvobracteata becoming a synonym of G. osyana and G. fusispica a synonym of G. bracteosa. Fig. 1 shows a series of photos of the clonotype of G. recurvobracteata. Full details are in the article "Gouda, E.J. 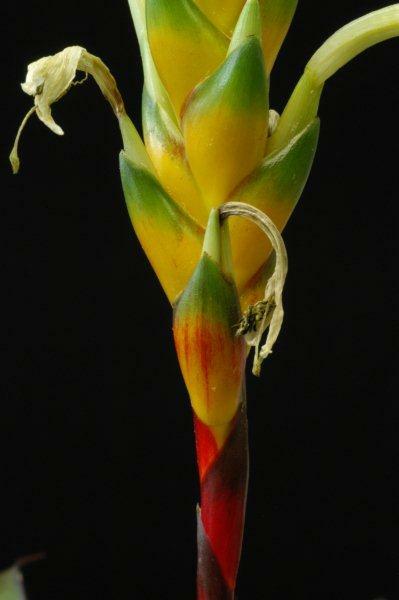 (2011) The correct name for Guzmania fusispica. 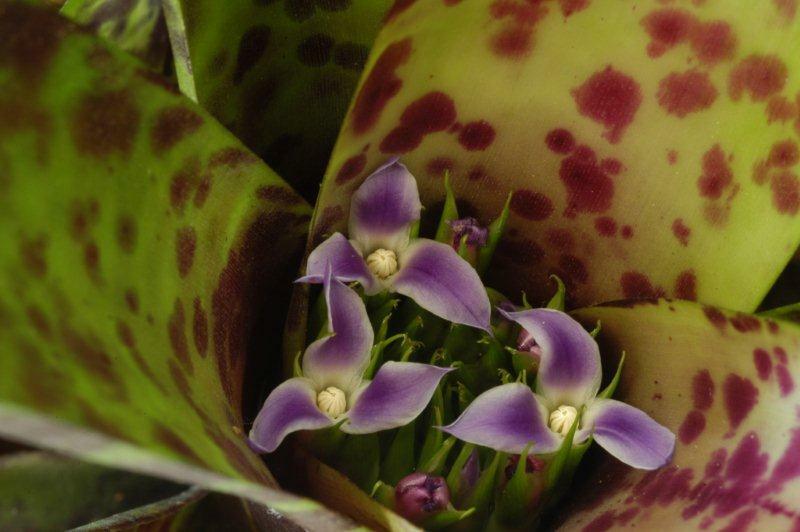 Journal of the Bromeliad Society. 61(3):102-103", in which they unfortunately forgot to print the photos. In fig. 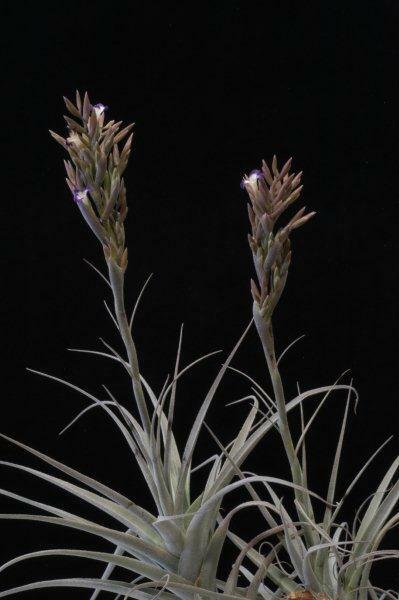 2 we see Tillandsia purpurea, which I myself have in various forms in my collection but which I have never seen flowering. It is therefore not easy to get it to bloom. 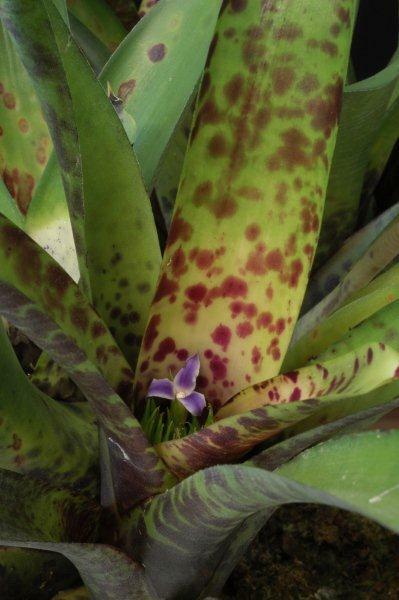 In fig.3 we see the splendid markings of Neoregelia smithii, a medium-large species. The innermost leaves, in particular, are lighter-coloured at the base and show this wonderful marbling. Lastly, fig. 4 below shows Vriesea malzinei which often has red bracts at the base with the ones higher up being yellow with green tips. In this plant the yellow is predominant but it is still a brilliant colour combination. Fig.4. Vriesea malzinei, photos by Eric Gouda, click on the photos to enlarge.